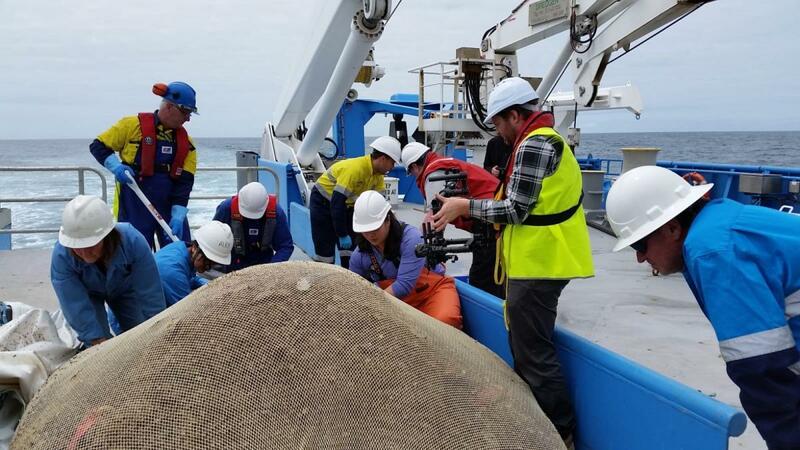 Participating in a marine research expedition is something I’ve always wanted do, so when I was offered the opportunity to come aboard Investigator with CSIRO, I simply could not refuse. Working at Melbourne Museum as a Collection Manager, I often handle specimens that have been collected in similar Australian expeditions, so I was eager to see how these specimens were obtained first hand. It’s easy to forget that the animals in vials and jars sitting in our museum’s collection stores were once swimming and crawling around more than one thousand metres below the surface in complex and diverse ecosystems. 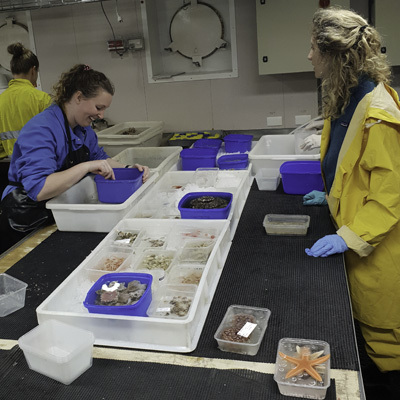 My role on the ship is to sort the biological material collected by our benthic sleds. So far, we have undertaken four beam trawls and collected a plethora of weird and wonderful marine creatures. Once we get word that a beam trawl has been deployed, we start preparing for the catch by chilling fresh seawater and making up trays of ice. 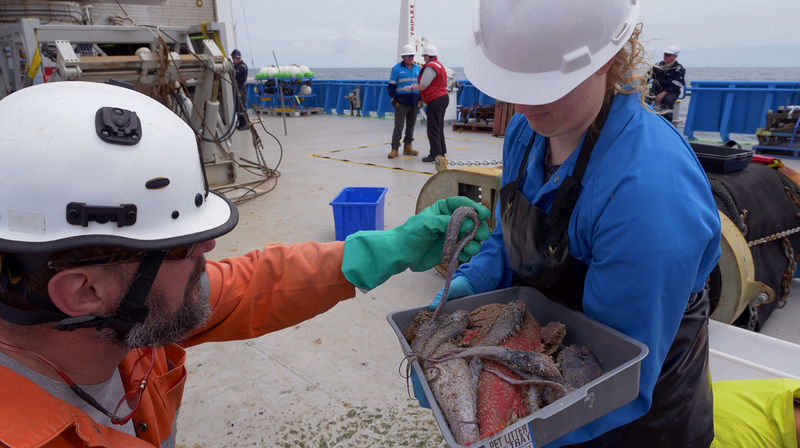 The scientists await the catch on deck, safely inside a cordoned-off area while the large winches are in use. When the catch is ready, we hasten to pick out any large or interesting animals and put them on ice in the lab to prevent any decomposition. We gather the remaining material in large tubs bring them into the lab where everything is weighed and put on ice or refrigerated. We then have the large task of sorting through the animals and grouping them by their taxonomy. This basically means grouping the animals that look the same; all the shrimps together, all the shells together and so on. We continue to divide them up into smaller and smaller groups, then begin writing labels for each group. We copy the information on data sheets, weigh the animals once more, photograph them, and preserve them in jars. The preservative used depends on whether the scientist wants to preserve the animals’ DNA or morphology – formalin for morphology and ethanol for DNA. Depending on the size of the catch, this process can take anywhere from a few hours, to the better part of a day. At this point, scientists on board are welcome to look at the animals more closely and try to put family, genus or species names to each group. I have been assisting Research Fellow Laetitia Gunton in identifying polychaete worms, while others have been busy with mollusc shells, brittle stars and corals. 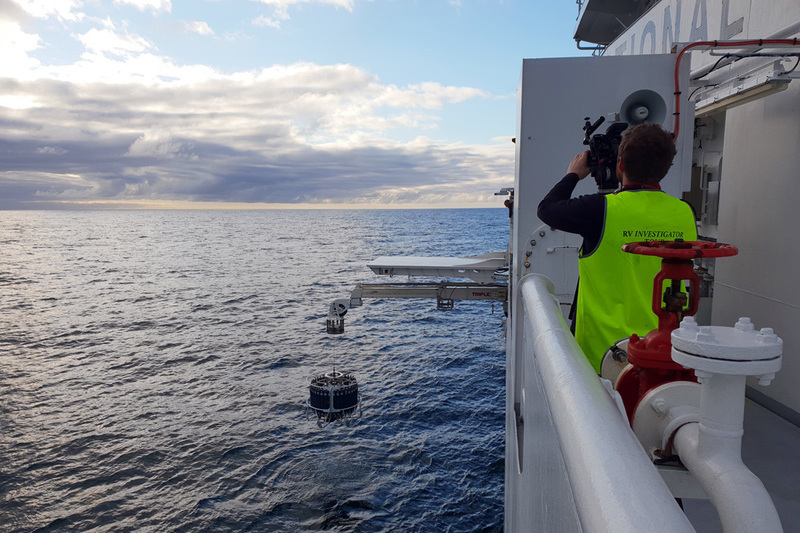 I have also been able to assist with the CTD (conductivity, temperature, depth) deployments, a device that brings up seawater from varying depths, allowing on-board scientists to calculate the temperature, oxygen and nutrient composition of seawater. I’m also trying to learn what I can from the seabird and marine mammal team, I was lucky enough to spot a two-metre shark swimming right next to the ship! Apart from the bouts of seasickness, this voyage has been an incredible experience and I’m excited to see what the rest of the journey has in store! The continuing weather, waves and wind, have been sufficient to remove the possibility of towed camera operations today. A physical profile of the water column (conductivity, temperature, depth) at Maatsuyker was completed, and a high resolution multibeam swath map completed for this area to highlight both bathymetry and backscatter. 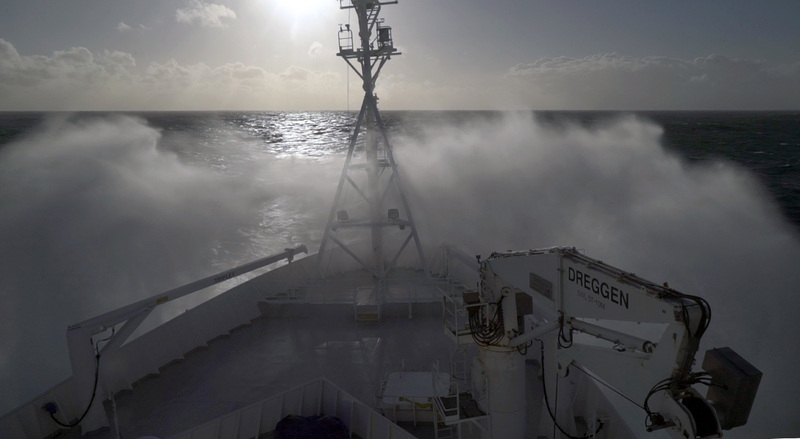 Conditions abated briefly but sufficient to complete a beam trawl over flat ground at 1200 m depth by main Maatsuyker. An interesting haul was returned: two species of octacoral (Thouarella sp.) complete with fauna sheltering in its structure including scale worms and squat lobsters (some juvenile and some berried). There was also a possible new species of sea pen (Umbellua sp.) and a gargoyle fish or small-eye rattail. Since then, we have been swath mapping in the area between the Huon and Tasman Fracture Marine Parks – useful work but not that interesting while it proceeds. The lack of new operations (apart from the single beam trawl) has provided time for the taxonomists to complete initial description of all videos collected to date and get close to caught up on the quantitative evaluation of 2000 stereo pairs from the still camera (a 10% subsample of all images collected). The electronics and gear technicians took the opportunity to remove the optical slip ring from the dedicated winch used for the towed camera and transfer the towed camera to the MNF winch and operating system. A new optical slip ring will be delivered with the crew exchange on Wednesday, so that we can have both camera systems fully functional again. The optical slip ring sounds simple but has to connect the optical fibre coming from the camera on the seafloor and mounted on a revolving winch to a stationary optical fibre on ship that feeds into the ship’s visual system. Laser beams and photodetectors are involved.